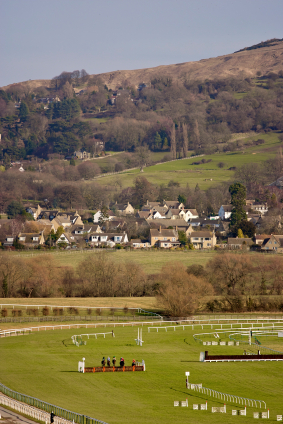 The Cheltenham Festival is another one of the great National Hunt races in the UK. This multi-day event draws in competition from across the world, and is second only to England’s Grand National in prize money. The biggest draw to this race is because the best British and Irish horses compete against each other. The normal racing season does not see this competition to the same extent as during the Cheltenham Festival. This National Hunt Meeting originated in 1860. In the beginning it was simply a few steeplechases held together, and it was held in different locations for a number of years. In 1911 it finally settled on the location that it is currently held at. The Cheltenham Gold Cup was the first championship race organized at the Festival. The festival was extended from a 3 day event to 4 days in 2005, allowing the organizers to give each of the highlight races their own day. This also allowed them to add 5 more races to the festival. Over the years the Festival has been cancelled or delayed a handful of times due to war, contagious disease and extreme weather. The Cheltenham Festival is held every March, a 4 day event always held over Saint Patrick’s Day. There are 28 total races over the 4 day festival. The biggest draw to this festival is the competition between the British and the Irish horses, however there have been other international victories as well. The crowning event of the Cheltenham Festival is the Cheltenham Gold Cup. This race is open to horses 5 years and older. At 3 miles and 2 ½ furlongs, this is a long and arduous race. There are 22 fences to jump, and this race is certainly not a race to take lightly. Like all testing races, the Gold Cup has seen it’s share of injuries on the track. This does not by any means make it a necessarily dangerous or cruel sport. The Cheltenham Gold cup has beautiful trophy sponsored by totesport. There is a new solid gold trophy minted every year for the winning horse’s owner. The trophy boasts 10 ounces of gold and the 2011 trophy was worth approximately £10,000. This trophy is one of the most sought after in the National Hunt circuit. The dollar value of the golden trophy does not compare to the prestige and honor in winning one. But that does not deter greed. A testiment to the beauty and value of such a trophy is the great heist in 2010. The 1988 Gold Cup trophy as well as a number of other trophies were stolen in a burglary. The Cheltenham Festival with all 28 races has an overall purse of over £3 million. This huge purse is spread out well over a large number of races, however. This purse has recently had a noticeable increase which marks the Festival’s first half million pound race. The Cheltenham Gold Cup, the crowning jewel of the Festival now boasts a £500,000 purse, with nearly £300,000 going to first place.